Are you looking for a good mattress store in San Jose? Check out our guide below. The hardworking citizens of Silicon Valley take their sleep seriously. Science has repeatedly shown that a good night’s sleep boosts productivity- along with creative thinking, mood, and immunity – and that the right mattress is essential to achieving optimal rest. For some, this may mean an adjustable bed with temperature regulation. For others, an all-natural mattress made with alternative, plant-based materials might be ideal. Tech aficionados may appreciate a mattress that integrates smart sensors to track and adjust to changing sleep positions and patterns. And, as anywhere, a great number of people just want to find a simple and affordable mattress in San Jose. No matter your sleep style or price point, we’ve got you covered. 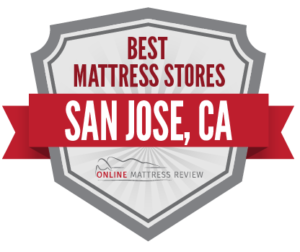 We’ve surveyed all 41 mattress shops in Northern California’s most populous city, to bring you the best mattress store for every need in each area of San Jose. Read on to find out exactly where to find a mattress in San Jose, right in your neighborhood. Located in the Japantown neighborhood, Furniture Super Discount (999 N 10th St), a family-owned, no-frills furniture and mattress warehouse with an excellent selection of affordable mattresses. Another option for purchasing both furniture and mattresses together is New West Furniture and Mattress (2398 Stevens Creek Blvd). Customers can get a deal here by buying multiple items together, such as a mattress and bed frame, or by bargaining with the sales associates. If you’re simply in the market for a name-brand mattress from a reputable mattress shop in downtown San Jose, visit Mattress Firm San Jose Market Center (519 Coleman Ave). This national chain retailer sells such popular brands as Beautyrest and Serta, along with more specialty items, like adjustable and hybrid mattresses. Customers give top marks for knowledgeable staff and easy delivery (free for purchases over $500). If you’re considering buying a futon in North San Jose, visit King Futon (1640 Remuda Ln). Customers who like firm mattresses give high marks to the store’s Indian cotton mattresses, and the shop will also cut foam to fit for specialty orders, such as beds for RVs and boats. Less than a mile away, What a Room! (545 E Brokaw Rd) specializes in custom sofas, but sells mattresses as well. This furniture and mattress store earns great reviews for customer service, quality and value, making it a great choice for the purchase of a sofa bed, or mattress with bedroom set. A more traditional place to buy a mattress in San Jose to the north is Mattress Firm Berryessa (1098 E Brokaw Rd). This chain retailer sells a wide variety of brand-name spring, memory foam and adjustable mattresses. Whichever store you choose, big chain retailers are where to buy a mattress in San Diego south of the city center. Mattress Firm has no less than five locations in the area: Blossom Hill (858 Blossom Hill Rd), Blossom Hill Center (1033 Blossom Hill Rd), Willow Glen (1558 S Bascom Ave), Edenvale (5770 Cottle Rd), Almaden Ranch (5026 Almaden Expy). In the Almaden Valley neighborhood, Mancini’s Sleepworld (1086 Blossom Hill Rd) has earned an impressive 276 5-star reviews on Yelp, with customers frequently praising the store’s staff for in-depth knowledge and no-pressure sales tactics. In the neighborhood of Westfield Oakridge, you’ll find a Sleep Number (925 Blossom Hill Rd) location. This national chain of mattress stores specializes in mattresses with adjustable elevation and firmness. Couple who have different firmness or temperature preferences will appreciate the store’s combination mattresses. Sleep Number also touts its technology-integrated 360 Smart Beds, which sense a sleeper’s movements, then automatically adjust levels of firmness and support. The Futon Shop (5021 Almaden Expy) is a California chain which specializes in not only futons, but natural and organic mattresses and home furnishings as well. Customers praise the store’s top-quality mattresses, including those made from such alternative materials as wool, latex and even coconut fiber. There are decidedly few mattress stores in San Jose east of the city center. One local resource for both affordable mattresses and furniture is City Sleep Furniture (561 Tully Road). City Sleep carries several lines of top brands, including Serta, Simmons and Ameristar. Customers can save further during the store’s frequent specials. Another option is Mattress Firm, which has locations in the neighborhoods of East San Jose (1597 Tully Rd) or The Plant (189 Curtner Ave). Both locations earn positive reviews from customers for having courteous and professional sales associates and affordable prices on the most popular brands (including matching competitors’ prices). You’ll find no less than six mattress shops in West San Jose within a mile of each other, including two Mancini’s Sleepworlds (50 N. Winchester Blvd) and (3430 Stevens Creek Blvd), two Mattress Firms (3615 Stevens Creek Blvd) and (3785 Stevens Creek Blvd), Sleep Number (2855 Stevens Creek Blvd), and Sleep You Deserve More (Bldg 300 Santana Row). Of these, both locations of Mancini’s Sleepworld earn the highest reviews. Customers praise the store’s attentive, patient and no-pressure customer service. This mattress shop carries name-brands at all price points, and also manufactures their own brand of high-quality, affordable mattresses. With so many stores in the same neighborhood of West San Jose, comparison shopping is both worthwhile and convenient. Sleep You Deserve More is place to buy a mattress in San Jose when money is no object and you want the best of the best. This store sells uber-luxe mattresses by Hastens, a Swedish company which has been hand-crafting mattresses since 1852, and Vispring, a British luxury mattress company in business since 1899. All mattresses and bedding are made from such natural materials as flax, cotton, wool, cashmere, silk, Swedish pine and hypoallergenic horsehair. Celebrities and other VIP customers can even book a discreet, private shopping experience.